Trouble doesn’t overthink things, which is one of the reasons she’s such good company. So she is not puzzling over the whys and the hows, as Human is — she is just delighted to be free of the cone of shame and to have the regimen of medications reduced to just lubricating drops until her next check with the surgeon. The keratectomy has done its magic: within six days of the procedure the ulcer had shrunk to a pinpoint; on day twelve, it was pronounced fully healed. No stain uptake in any tissue. The vet, the assistant, the office manager, other clients in the waiting room — everyone had a huge smile, and there was a little wine with dinner that night. Human continues to puzzle over how removing a microscopic layer of tissue can promote healing — it’s counterintuitive that a large raw surface should heal faster than a partially healed ulcer. But that’s what happens, in nine out of ten dogs, the surgeon says, and in the tenth, there’s usually some underlying unsuspected condition which has been interfering with the healing. But of course, it does make sense. It’s a bit like throwing pots. When you work your clay on the wheel, you shape it to bring it closer and closer to your vision — but there are times when you have to let the whole thing collapse and start afresh. Fiddling with it, like debriding the ulcer, is just not working. Go back to the raw clay. And throwing pots is like writing (isn’t everything?). Human believes in the power of revision, working with the draft until it becomes, through successive versions, closer and closer to what it should be. But there are also times when you have to put the whole mess aside, and start fresh. Go back to the raw clay. Whatever your chosen technique — blank paper, free writing, writing against the clock, turning off the monitor and writing blind — it somehow frees the clouded vision. Warm thanks to Trouble’s vets in Halifax and to CullenWeb Animal Eye Specialists in Moncton. 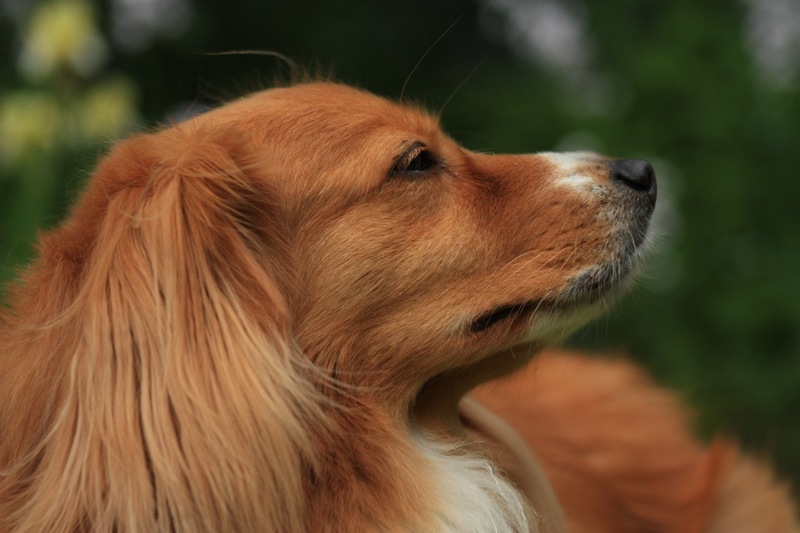 This entry was posted in Back to the beginning, Revision and tagged cone of shame, free writing, indolent ulcer, keratectomy, revision, toller, trouble, writing on July 9, 2014 by Susan Drain. 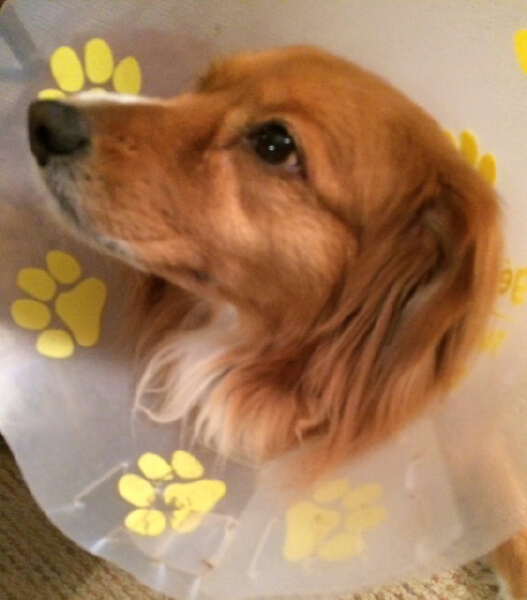 Trouble fi nds the yellow-splashed plastic cone that frames her head very tiresome. Almost as tiresome is the inevitable greeting from passers-by – “oh,” they say, “the cone of shame.” Sympathy quickly follows (“What’s the matter with her?”) but the first reaction always refers to shame. Trouble’s trouble is an indolent ulcer of the cornea. She scratched her eye, somehow, somewhere, at the end of April, and now (past the middle of June) it’s an indolent ulcer – one that can’t be bothered to heal itself. Certainly it resists treatment, including but not limited to pain meds systemic and topical, antibiotic drops, lubricating gel, and even her own blood serum, spun out of a blood sample and instilled drop by refrigerated drop into the eye. Right now, it’s four kinds of drops, four times a day, with five to ten minute intervals between them. Human has a wall chart to check them off, which she does faithfully though not without grumbling. You grumble, thinks Trouble, squinting upward and sliding her third eyelid toward the ulcer; you aren’t getting the sting and blur sixteen times a day, with only the tiniest of liver treats to compensate. Three local vets have consulted, prescribed and debrided without making much impact on the ulcer’s indolence. Earlier this week Trouble was examined by the veterinary ophthalmologist – a round trip of 525 kms – and will make that trip again next week for a keratectomy. Human is not so secretly hoping that the pre-op examination will reveal the ulcer finally starting to heal. Time will tell. Not the park, but pretty good! Meanwhile, Trouble is not permitted to run free in the park, for fear of brambles. She wears her collar almost all the time: it only takes a moment to scratch or rub the painful eye, and make things worse. And Human wishes she had a collar to prevent her from worrying her own injury. The letter has finally come from Publisher N – “Thank you for submitting your proposal, but no, we will not publish your book.” Her pride and confidence are severely damaged, despite stern self-talk. Even the positive talk galls the injury, notice: “Who are you to dispute it?” Humans, Trouble knows, are apt to make life more complicated than it needs to be, and Writing Humans are worse. A manuscript rejection? That’s no poke in the eye with a sharp stick. Human is still intact. Her capacity to throw sticks and dish up kibble is unimpaired, and so is her capacity to rewrite the cover letter and address an envelope to another publisher. If she’d only stop scratching the sore spot. Someone give that Human a cone of shame, and a deadline to get the next proposal off. This entry was posted in Uncategorized and tagged cone of shame, indolent ulcer, publishers, Stephen King on June 20, 2014 by Susan Drain.